The most serenely quiet place you could ever find is the heart of the desert at night. Miles away from civilization, this is where peace and quiet reigns, when there is no wind to whip up a sandstorm., no leaves to rustle, or any insects around to puncture the peace. It is therapeutic. Not so with the sand that disappeared from a beach in Jamaica. 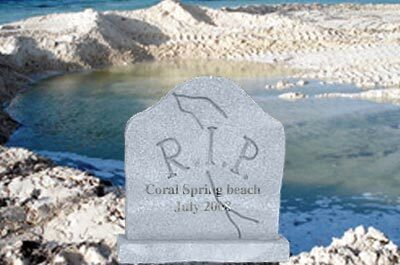 Perhaps after all the months of pleading with the authorities to disclose the whereabouts of yards of sand that mysteriously vanished from the Coral Spring beach in Trelawny on the island’s north coast, the citizens should just call it a day and bury the whole damn thing. For if “termite brains” had afflicted the previous administration, then it must be “lockjaw” that has silenced this one. With the exception of the tepid mumbling that pretended to be an official statement on the findings of the investigations, the same team of inquisitors that had launched attack after attack at their predecessors, are now tormenting the public with their condescending and unnerving silence. Perhaps they think that if they say nothing, it will, like the Trafigura oil scandal, fade away. But who are they fooling? With the Internet on the prowl as the worldwide watchdog, they can’t “hush up” this one. All of last week the BBC report on the Sand Heist did the rounds, and now the news has gone global. This incident is symptomatic of a greater problem that plagues us, and lies at the heart of the increasing indifference to government and the lack of hope that justice will ever prevail in Jamaica. From their safe distance above the fray while in opposition, it was easy for these characters to pick at the threads while the nation was coming apart at the seams, but now having assumed leadership, they have adopted the characteristics of their predecessors who once held the nation to ransom. Does the Stockholm Syndrome come to mind? Jamaicans had better wake up from the endless slumber of ignorance and apathy. Are we just playing at being a nation bent on correcting the misshapen attitudes of our people, pretending to be concerned, civilized, and caring about the environment and the future of Jamaica, when we persist in being blind, deaf and dumb about injustice and the multitude of atrocities pulling Jamaica further into the cauldron of chaos and lawlessness?